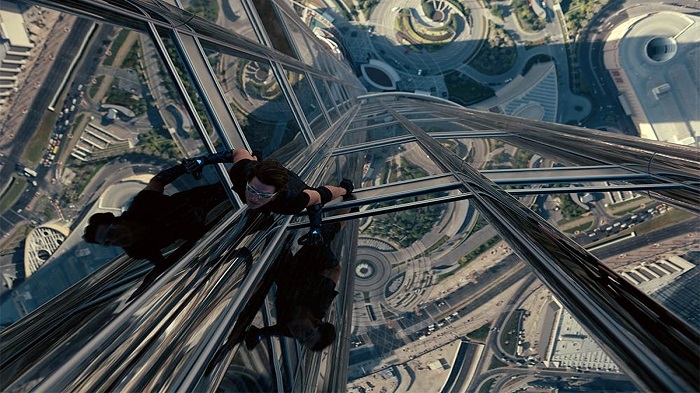 Did you have a nerve-racking moment while watching Ghost Protocol, when Top Cruise jumped off from the tallest building of the world, Burj Khalifa? The thought that Tom Cruise might have climbed the 110th floor jumped off the building might have boggled your mind. The fact is, these stunts were as dangerous as it looks and the funniest part is that the scene was shot on a partial set down at ground level, with CG building extensions as it was impractical to shoot such dangerous shot in real; including Ethan’s glove malfunction, kicking and breaking the server room glass, and the heart-pounding jump from the open window all were done with the magic of VFX. The definition of VFX says that it involved in the integration of live-action footage (special effects) and generated imagery (digital effects) to create environments which look realistic but would be dangerous, expensive, impractical, time-consuming and impossible to capture in a film. Not only that, a lot of movies are nowadays incorporating computer-generated imagery (CGI), with the introduction of affordable and easy-to-use animation and compositing software for creating masive VFX heavy content. Technically speaking, creating VFX heavy content contains a lot of planning as it has become one of an integral part of movie’s storytelling. Although most of the VFX are done during post-production which is usually planned and choreographed in pre-production and production. Integrating CG and VFX into live action is one of the best ways to make CG feel photo-real as it allows the user to add content such as motion graphics to assist explanation. When working on animation tracking live footage provide data to allow correctly position the CG tracking software. For an example replacing Ralph Fiennes’ nose area with Lord Voldemort’s CG snake-like nose in the Harry Potter series throughout the 46 shots the VFX studio built a rig with three layers of animation controls which enabled them to make full use of the 16 tracking markers attached to head with the flexibility to animate the cheek, upper lip and nose areas as needed. Not only that they kept natural facial creases as possible while using CG skin textures to remove shadows of Fiennes’ nose. Forced perspective is a technique that employs optical illusion to make an object appear far away, closer, larger or smaller than it actually is. It manipulates human visual perception through the use of scaled objects and the correlation between them and the vantage point of the spectator or camera. For an instance for the movie Elf, forced perspective was one of the most used VFX filmmaking tricks has been used to create shots in the film where the oversized Buddy struggles to fit in with Santa’s elf community. 3D modelling and sculpting are the enthralling techniques to bring characters, monsters and all kinds of organic shapes to life. While many 3D modelling programs focus on precision, 3D sculpting apps are all about turning a piece of visual clay into a stunning 3D print. Taking the example of recent movie Zero, the technology of widely reshaping and transforming the body of the actor Shah Rukh Khan into a dwarf. Although a lot of these techniques are used in game development as well but in movies also it is quite popular. HDR (high dynamic range) floating point is essentially the snapshots of the real world which contains minute details of lighting information, which can be transported from not so light CG objects into realistic virtual environments. And the outcome of this use of technology is well blended that momentarily you might start believing that it is real. Apart from that this technology provides accurate lighting which can be seen in the background and in reflections, which makes them more immersive. Taking an example of the movie Baahubali: The Beginning the opening scene where the actor hallucinates his lady love around the amazing flora of the mountains. Motion Tracking is one of the important for any VFX artist to understand. Without it there would be no way to incorporate 3D data into live action footage. With the advancements of software’s and the machines which run them, motion tracking has become more affordable and faster to accomplish. Taking an example of the recent movie 2.0 a lot of this technique has been used with the addition of live action to create the movement of the robot with the sci-fi touch. Everyone is born with a creative mind so we dream big with heaves of ideas but sometimes we seldom translate those ideas into reality. But with the art of this modern technology, we hope to bring our imagination to life with the integration of unreal elements into real-world footage.